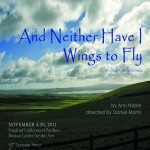 And Neither Have I Wings To Fly by Ann Noble, Bad Habit Productions, Deane Hall at Boston Center for the Arts, 11/4/11-11/20/11, http://www.badhabitproductions.org/index.html. (Boston, MA) A cast of actors must take on the nearly-impossible task of becoming a family in the space of mere weeks. They must create the timing and intricacies of a brood that normally would develop over decades. It requires trust, big heart and the ability to listen on stage. It’s when a troupe, full of jitters from opening night, doesn’t quite succeed that you understand just how difficult that task can be. And Neither Have I Wings to Fly is a chewy Irish family drama that begins shortly after the funeral of the family matriarch, Moira Donnelly (Sally Nutt). Those that remain of the Donnelly family are left rudderless with her passing; they must pull themselves together and carry on for the impending wedding of Leo Doyle (Glenn Moore) to Kathleen Donnelly (Jenny Reagan). But each member is damaged from the prolonged illness and death of Moira. The patriarch, Peter (Douglas J. Cochrane), is a shell of a man. The eldest daughter, Eveline (Bridgette), manically cares for the family, ignoring her own dream to study at a university where she has won a full scholarship. And Kathleen drinks too much and is self-destructively impulsive. There is a feeling that everyone is hoping they can make it through the next week to the wedding; afterwards, they can settle down to the unchanging days of the rest of their lives. But three characters of chaos enter to thwart their plans. First, an old flame of Kathleen’s, a charming and unstable actor (Evan Sanderson) comes prancing through the door. It’s clear the manic thespian wants to sweep Kathleen off her feet, if only for the sake of doing so. But it is Eveline who faces the biggest challenge, as she must contend with both the ghost of her dead mother and a budding romance with Leo’s prodigal brother, Charlie Doyle (James Bocock). The two sisters must choose their paths at a time when their parents no longer can care for them. The production was undertaken by Bad Habit Productions, a scrappy company which is clearly so earnest and threadbare that it even has actors wait outside after the show with donation baskets. That zeal to succeed is evident in the show. The actors don’t spare the emotion, and they tackle their accents with gusto, even if they aren’t always successful in agreeing on the sound of the Irish tongue. The production shines when chaos reigns. Bocock brings an understated prickliness to his portrayal of Doyle. He makes every actor who shares a scene with him better. In a different vein, Sanderson’s manic energy, particularly in his unhinged Shakespeare monologue, can sometimes turn a scene up a few notches. Unfortunately, such moments do not create a complete picture. Nor are the actors helped by an awkward set; I wished the design of the home was made less literal to give the actors more space for their many exits. In the actor Charles Grodin’s first memoir, It Would be So Nice if You Weren’t Here, he describes the feedback he received in an acting class after a scene fell flat. The acting coach praised a beat in the scene that seemed a mistake, when Grodin’s acting partner nearly forgot to give him an envelope. The coach called it the only real acting moment in the scene, because Grodin was uncertain what would come next and had to truly listen to his partner. This is what is needed for this production to succeed. It was clear on opening night the actors have done the heavy lifting of toiling the emotional depths of their own characters. Now, their task must be to slow down, listen to each other, and embrace the uncertainty of each scene together. Only then can this production soar. 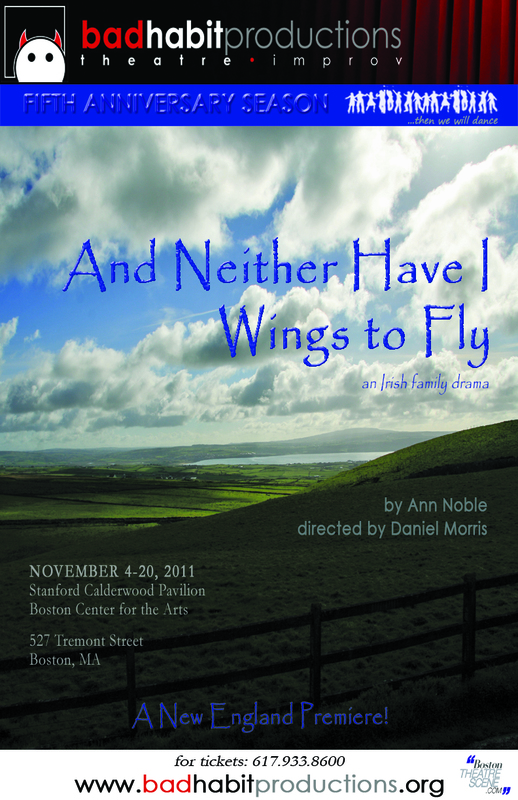 This entry was posted in Drama and tagged 2011, And Neither Have I Wings To Fly, Ann Noble, Bad Habit Productions, Daniel Morris, Evan Sanderson, Glenn Moore, Irish, James Bocock, Jenny Reagan, November, Sally Nutt by craigidlebrook. Bookmark the permalink. Correction. James Bocock was originally noted as James Babcock.